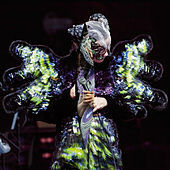 Björk is hard to pin down and trace. Pointing to her pre-solo incarnations as a jazz singer, a Crass Records punk and an international indie-pop star with the Sugarcubes only shows a fraction of her depth. Since her Debut, in 1993, she has created a symbiosis between academic music and pop, her hands holding a score by Karlheinz Stockhausen while her feet dance to the faceless sounds of rave culture. Masterfully, her music never flies out into obscurity or stoops to obviousness. Working with innovative producers and remixers, such as Nellee Hooper, Howie B., Mark Bell, Matmos and, most recently, Timbaland, she has been able to consistently change strategies, keeping her sound contemporary, gently nudging at the edges of the mainstream. While she takes these adventurous turns through her career, her versatile voice is unmistakable. 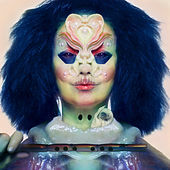 She displays wide emotional range from the contained rage of "Army of Me" to the explosive joy of "It's Oh So Quiet" to the ethereal bliss of "All Is Full of Love." While her music is always challenging, her fine art and screen side-projects are equally thought-provoking. For the Palme D'Or-winning Lars Von Trier film Dancer In the Dark, she won a Best Actress award for her leading role at Cannes in 2000. She would later collaborate with long-time boyfriend and fine art star Matthew Barney on the eerie and indulgent film Drawing Restraint 9.